I started this series talking about PVI generally, and then hPVI more specifically. 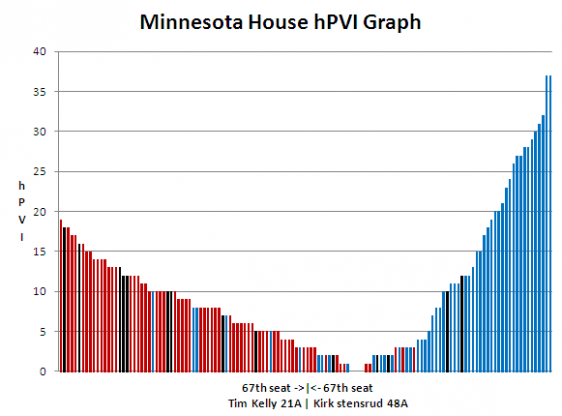 Last week I actually posted some real, live hPVI numbers for the Senate. And today are the hPVI numbers for the House. The below graph will look familiar to you if you read the post linked above about the Senate numbers, if you didn’t, well there is a link to that post above, so you might want to check it out that way I don’t have to copy and paste my explanation of this graph from that post. Not surprisingly this graph looks a lot like it’s Senate counterpart and like in the Senate, the median district is R+3. R+3, as we learned previously, is close to the center of gravity of legislative elections in Minnesota over the last few cycles. 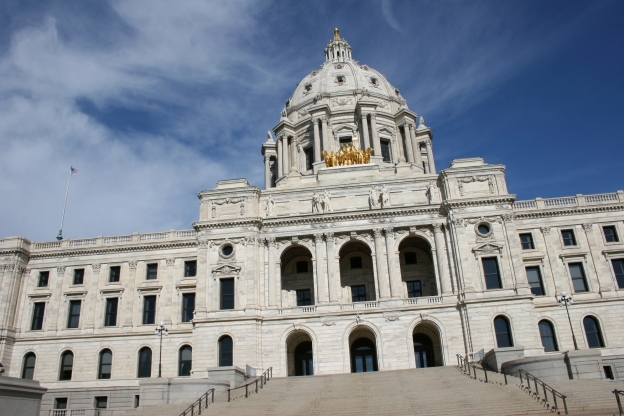 The GOP currently holds five seats in DFL leaning districts, although two of those incumbents, John Kriesel and Morrie Lanning both in D+3 districts, decided not to run for re-election. Three have remained to try and hold their seats, those brave souls are Rich Murray (D+3), Diane Anderson (D+1) and King Banaian (D+1). There are two vacant seats that are at D+2, 43A and 20B and one that is EVEN, 37A. The other two EVEN seats are both from the incumbent on incumbent battle royal extravaganza that is the fifth Senate district. That’s the top ten house pickup opportunities for the DFL and they are all DFL leaning to EVEN at worst. A number of DFL incumbents occupy red districts, but like on the GOP side, some of these incumbents have decided to pack it in rather than face a tough electorate. Larry Hosch in 13A, facing an R+10 district decided to hang it up, as did Kory Kath in his R+8 district and Denise Dittrich in her R+7 district. There are seven DFL incumbents running in GOP leaning seats, they are John Ward (R+8), Patty Frtiz (R+5), Andrew Faulk (R+3), Paul Marquart (R+2), Kim Norton (R+2), Melissa Hortman (R+2) and Joe Atkins (R+1). If the DFL were to hold all of it’s GOP leaning seats, they would need to win every seat on this list up to and including Greg Davids in order to re-take the house. If you think for instance that John Ward might be in trouble though, than they would also have to pick up Tara Mack’s seat, and so on.